We’re keeping our fingers crossed for the Azores High to deliver a ‘summer’. WE ARE NEARLY through one month of summer and all it has brought is rain and cooler temperatures. Recent summers have had their fair share of wet spells. Now we are breaking records once more but unfortunately, it is all rainfall records and not temperatures like we did in May. For example, with official rainfall figures submitted to Met Eireann from my station at Killucan, Westmeath, the average for June is 71mm; I have recorded close to 160mm so far this month compared to 12mm for the whole month of March and it looks like most places will set new June rainfall records. The simple reason is low pressure – low pressure lining up to take a swipe at us several times a week over June – and the Jet Stream, which is close to our south coast or even up over us. The Jet Stream is a thin band of fast moving air high up in the atmosphere blowing west to east which can blow at speeds of 200-300mph. Ever wonder why it is sometimes quicker flying back from the states on a tail wind? This is why. Close to the Jet, low pressure forms as the result of different airmass colliding between cold polar air from the north and semi-tropical air originating from the south. It is a so-called breathing ground that spawn low pressure close to this energy source. In late autumn and early winter, the airmass from these sources tropical and polar can vary greatly, with deep cold undercutting the warm air from the south forcing it to ascend rapidly which in turn pumps more energy in the Jet Stream, storm depressions form out in the mid-Atlantic and usually track close to our northwest, bringing significant damage from violent winds. This is a picture of the current Jet Stream moving west to east, ridging and troughing across the Atlantic. What we would like is for this Jet to buckle north towards Iceland and allow for the Azores High to move towards us. At this time of the year, the Azores is parked firmly in place close to the Azores Islands well to the southwest of Ireland. This time of year, it serves to deflect tropical depressions west towards the US and Caribbean on it’s southern flank but it contains a lot of warm air within this system. It’s a near distant memory since we had an Azores move up towards us which would deliver a heatwave to this island. The saving grace is that there is a couple of months of summer left to go, so fingers crossed. With its current position, we can expect unsettled weather to continue with frontal rain or heavy showers or thunderstorms for the medium range at least. Over the last four weeks since our fine spell of weather in May, low pressure has taken a firm grip and moved north across Ireland with the frontal rain wrapped around the centre. Low pressure has ascending air which circulates in towards the centre and with different airmass colliding ie: warm and cold weather fronts form a process called ‘frontogenesis’. Recently, with the heavy rainfall of the 27th/28th of June which brought floods to Cork and around Belfast, there was a subtle change in wind direction. Although not quite a Spanish Plume the wind was sourced from way to the south of Ireland. The warm air from the south moves north over slightly cooler waters and humidity builds towards the surface, making it feel muggy with humidex high (the opposite of windchill) so it feels much warmer and heavier than the air temperature is actually reading. Given enough time for this wind to move from the south towards us, the air becomes unstable and elevated containing a lot of energy or heavier rainfall. With the weather fronts moving gradually towards us, it pulls this warm moist air ahead of it rainfall increases with thunderstorms breaking out in the Celtic sea to our south. A cold front usually acts as a trigger as it forces the air to rise more and rainfall increases in intensity as it moves into a warm and moist rich environment. This is what happened over Cork with the increased rainfall in a short period in time which paralysed parts of the county, flooded homes and businesses with over 30mm falling in a couple of hours (and close to 50mm overall for the event). These floods were aided by the higher-than-normal amount of rainfall that has fallen in parts of Munster over the month of June where rivers and streams were higher than normal and the ground fairly sodden. Earlier in the day of the 27th, Northern Ireland had thunderstorms bringing flash floods to parts of Belfast and surrounding areas. This was the result of warm moist air in place moving up from the south with the sun heating the surface destablising the atmosphere allowing for convection to build rapidly with heavy thunderstorms breaking out. These downpours where severe with 50mm in places falling in a short space of time but with the nature of showers, some places missed out altogether in Ulster. Again in these areas, homes and businesses were flooded with cars abandoned. As we move into July which is typically a warm and humid month, the trend of unsettled weather will continue with the chance of more rainfall. It is too early to say if the Azores High will make its presence felt – but we will welcome it with opened arms at any time. Karl Melhorn is the founder of the Irish Weather Network. You can check out Irish Weather Network’s updates on Facebook, on Twitter, or sign up for regular forecasts. 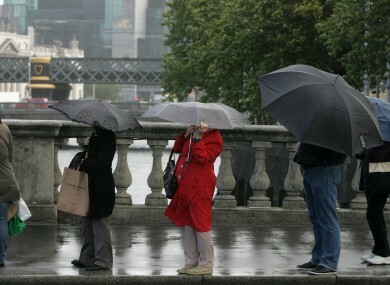 Email “Weatherwatch: Here's why June has been so soggy”. Feedback on “Weatherwatch: Here's why June has been so soggy”.